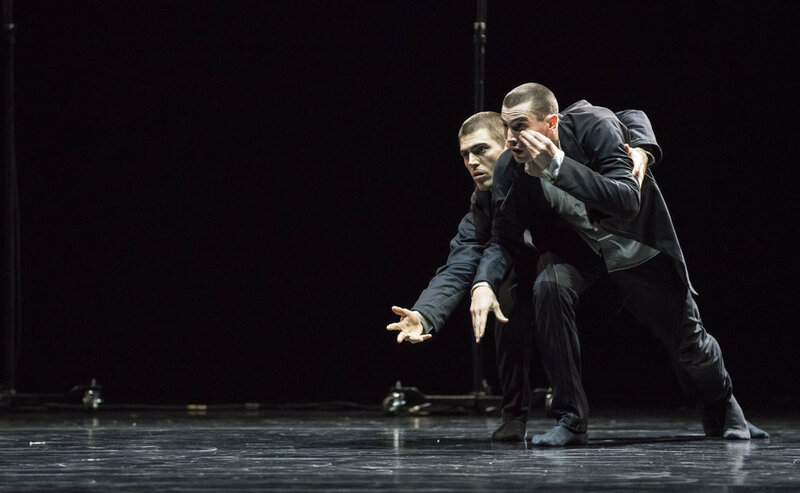 Hubbard Street Dance Chicago’s Winter Series program features work by contemporary visionary choreographer Crystal Pite. Hubbard’s dedication in providing thought-provoking work through taking an in-depth look at the work of individual choreographers during this season. The performance includes a full length duet, A Picture of You Falling, which was first performed as an excerpt by Hubbard in March 2014. Other premieres include Grace Engine and The Other You. 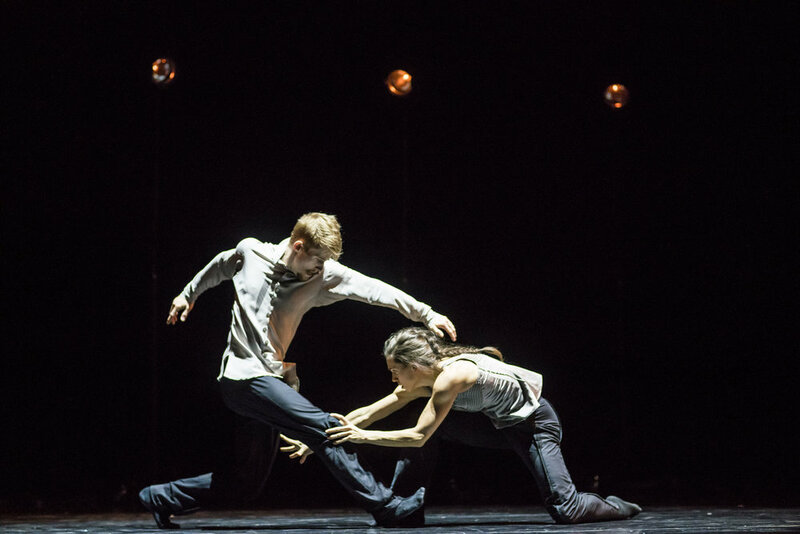 Crystal Pite is an award winning choreographer who has created over 50 works for companies such as The Paris Opera Ballet, The Royal Ballet, The National Ballet of Canada and more. In 2012, she formed her own company named Kidd Pivot in Vancouver. Pite’s evocative work weaves narrative through minute bodily movement demonstrating that simple gestures can have profound meaning in her works. A Picture of You Falling is a stirring performance focusing on the push and pull of the two main dancers. Jaqueline Burnett and Elliot Hammans compliment each other through strong shapes and elongated movements, while Kate Strong voices over simple statements. The intriguing piece dissects familiar human action into a re-framed perspective. The concept of self is challenged and that there is beauty in the mundane through repetitious movements, as well as it allowing self reflection and an opportunity for audience members to identify with qualities shown by the dancers. The beautiful lighting by Robert Sondergaard is a stripped down half circle of tungsten spots on rolling c stands contrasted with white lighting on the overhead grid gives a nice balance of visual effect. The changing and responsive use of light in the piece really cinches the narrative aspect. The Other You steps aways from interpersonal interactions, but rather on the singular. The connection to humanity and self is where this piece hinges on. Michael Gross and Andrew Murdock give an astounding performance! A modern Dr. Jekyll and Mr. Hyde in a codependent relationship each of us has with ourselves. Gross transforms into a puppetry of the psyche through minute movements and reactionary control by Murdock. Each other’s motions are painstakingly precise. There is a painstaking attention to the connection of humanity and the concept of man and beast seen throughout the work under the audio of a rainy city night by Owen Belton. Belton really sets a mood through the sound design. It provides context in a familiar narrative theme that are often seen throughout literature and various other arts: the head and the heart at odds, the conscious vs. unconscious, civility vs. savageness. Very thought provoking and highly enjoyable!! The night ended with a company performance of Grace Engine. A widened space allows the physical caliber of this company to really be showcased. Running, crawling, and falling across the space in various direction as one. Themes of the singular versus collective also arise in this work. When in a line horizontal across the space, the companies chain reaction movements and those that break the chain is a dynamic cinematic moments of struggle and rejection. This work hints at the collective drudgery and challenges the audiences perspective rewardingly individuality and complacently. An overall wonderful night of smart imaginative contemporary dance. Hubbard never ceases to strive towards new bold ideas and those familiar to be told in a new evocative format. Their Spring performance will include a two-night engagement dedicated to Resident Choreographer, Alejandro Cerrudo. For more information on Crystal Pite’s company Kidd Pivot, please visit www.kiddpivot.org. Hubbard Street Dancers Jacqueline Burnett and Elliot Hammans in Crystal Pite’s A Picture of You Falling. Photo by Todd Rosenberg. Hubbard Street Dancer Michael Gross in Crystal Pite’s Grace Engine. Photo by Todd Rosenberg. 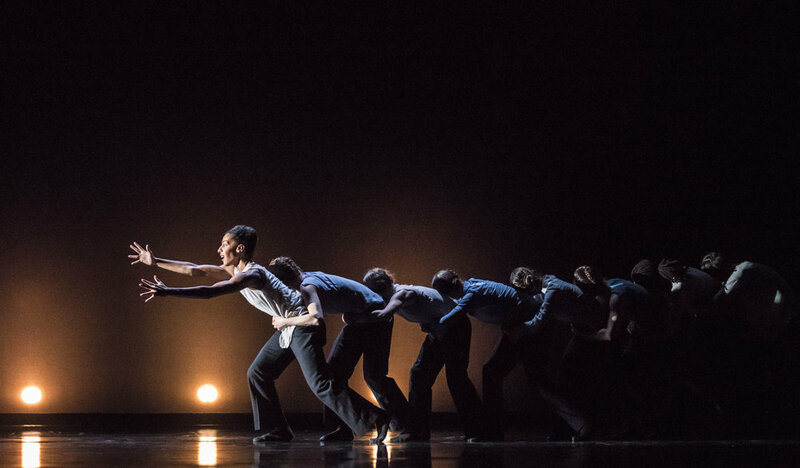 Hubbard Street Dancer Rena Butler (Left) in Crystal Pite’s Grace Engine. Photo by Todd Rosenberg. Hubbard Street Dancers Michael Gross and Andrew Murdock in Crystal Pite’s The Other You. Photo by Todd Rosenberg.